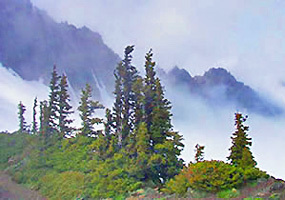 Olympic National Park is on the Olympic Peninsula in Washington. It is as visually stunning as it is unique. The rugged Pacific coastline, temperate rainforest, and Olympic mountain range come together to form a landscape like no other. The pacific northwest's best attributes are combined in this area, which benefits from an abundance of precipitation. To the west of the park is rainforest, with a thick woodland of gigantic Douglas Fir, Sitka Spruce, and Western Red cedar trees, among many other trees, shrubs, and plants. In the middle of the park stand the majestic Olympic Mountains, with glaciers feeding into crystalline lakes and rivers below. The Pacific coastline stretches for 73 miles through the park, and these waters help contribute to its thriving greenery. To the east are some nature-rich meadows with distinctive alpine zones. A lot of wilderness thrives in these areas despite the mountain snow. Snowshoe hares, Blue Grouse, and Black bears live in the subalpine areas year-round. Wildflowers and fir trees are also abundant here. The alpine region grows a different variety of plants that can survive on the rocky, glaciated mountains. Birds and small mammals such as chipmunks can be found in this terrain. The rest of the park's overall climate is variable, depending on the season and elevation. It can range anywhere from warm and sunny to mild and wet. In fact, the park receives more rain than anywhere else in the continental United States, so visitors should come prepared for diverse weather conditions. There many interconnected hiking trails throughout the park. One of the most popular destinations from these trails is Hurricane Ridge, which provides a great view of the Strait of Juan de Fuca. People can access Hurricane Ridge by car as well. The Hoh River Valley and rainforest is another popular destination, with an abundance of nature trails, a visitor center, and picnic area. There are also many hikes leading to waterfalls, lakes, rivers, and natural hot springs. The Olympic and Sol Duc Hot Springs are famous tourist attractions. Visitors in the mood for adventure can go whitewater rafting or kayaking in the lowland rivers and lakes. Lake Crescent and Ozette Lake are nice places to canoe or take a boating trip. Fishing is a great option throughout the park, and a license isn't required within its boundaries. The lakes and rivers in the Northwest are known for their salmon, trout, and steelhead. Mountain biking is another fun summer activity, and the Spruce Railroad Trail near Lake Crescent is the main biking path. Llama trips are a unique feature at the park. There is also horseback riding and mountain climbing in designated areas. Climbers especially like to scale Mount Olympus, which rises nearly 8,000 feet. Many visitors also enjoy venturing down to the Rialto Beach on the ocean to catch a dazzling sunset. The winter is also a fun time to visit the park. Hurricane Ridge and Snowboard Area is a good place to take advantage of this mountainous region. People also like to cross-country ski and snowshoe here because there are so many paths and trails to take. The lowland region of the park is temperate enough to explore in the winter months if you don't mind the rain. Olympic National Park is a theater for every kind of outdoor enthusiast all year. Olympic Lodge - relax and just watch the world go by in front of the large stone fireplace. Lake Quinault Resort - take a stroll along the beautifully landscaped grounds or light up the barbecue for a family lunch. Sol Duc Hot Springs - melt your tension away with a soak in the outdoor pure mineral-water hot pools. Lake Crescent Lodge - relax in this historic turn-of-the-century resort set in among the giant fir and hemlock trees. For more information or to find accommodations at Olympic National Park log on to www.NationalParkReservations.com or call toll free 855.584.5293.